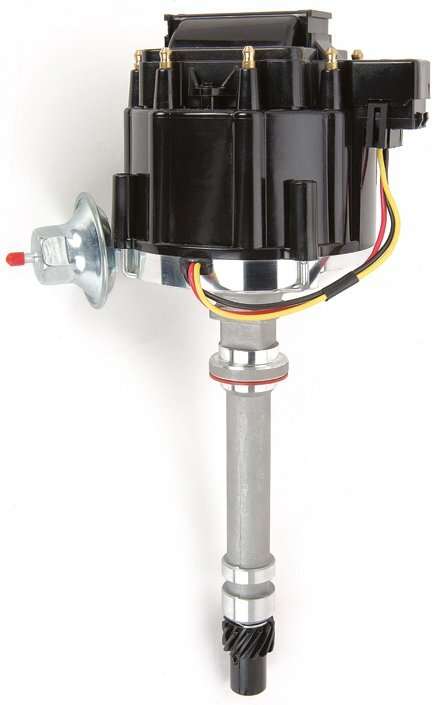 Replace your stock HEI distributor or upgrade a points distributor using JEGS HEI Street Spark Distributors. With show-worthy style & finish for small and big block standard deck applications, this distributor's performance module offers a longer dwell circuit and full-coil saturation. Cap and rotor have brass terminals for maximum voltage output. Does JEGS 40002 fit your vehicle? 40002 is rated 4.2 out of 5 by 5. Rated 5 out of 5 by Onslowe from High Quality Seems to be of very good quality, paired it with a new GM crate engine and am very pleased with both. Rated 5 out of 5 by Johnh69chevelle from Works great Looks great out of the box and it’s been installed for a few months and so far it’s been great. Rated 5 out of 5 by Crazy George from What a bargain! After the HEI in my El Camino died, I decided that I would just buy a new one as a replacement. A friend recommended a Jegs unit. When I opened the box I was amazed at how nice it was. The parts are well made and sturdy. I am very happy with this purchase, and would do it again. Rated 1 out of 5 by 81_k10 from Short Life This distributor only lasted about 4,000 miles before it died on me. It looked nice out of the box but had a very short life. I have a 1994 chevy 5.7 converting to carb.instead of fuel injection,Will this fit? Yes, this should fit your engine, you will need to make the attachments to the wiring harness. Yes, if it is an electronic tach. This will not work with a cable driven tachometer. Will the 40002 fit in a 1967 SBC 283? Yes, this will work in the 283 Chevy engine. I have the HEI factory zz4 engine, have installed Weiand 671 roots supercharger kit. Factory distributor too big. Will this distributor fit? this coming Monday 5/21/18 i will purchase a HEI for my 4.3 Chevy V6. Will it work? It was computer controlled distributor. I put the engine in my 50 Chevy pickup. I put a rebuilt 2 barrel on with a standard fuel pump. This will perform well to 6500 rpm. How many degrees does the vacuum advance add and would using it void the warranty on the 260hp crate I got from y'all? You should be able to get about 30 degrees of total advance from this distributor. As long as you use the correct distributor gear on your engine based on the camshaft, this will not void the warranty. If it is a GM engine a dealer will need to install the distributor. Will it fit a 283 engine? If not, what HEI will fit? Yes this will fit into a 283.